Adding a watermark to your video could help protect your video from copyright violation. Well, in this guide, we would like to show you how to watermark a YouTube video in different ways. To be straightforward, a watermark is a kind of mark or a symbol embedded in an object to identity its ownership or its authenticity. Nowadays, we have seen watermarks on various things, like postage stamps, currency, government documents, etc. People adopts watermark, a logo or text, to help prevent the content (image, video, movie, etc.) from being copied for other uses, or allow other people to know where this content comes from and who owns the copyright. After learning what watermark is, we now need to learn how to add watermark to a YouTube video. Actually, you could watermark a video before uploading it to YouTube with some video watermark maker software tools just like Leawo Video Converter, which has a video editor built in to help you watermark a video before you upload to YouTube or send to friends for sharing. 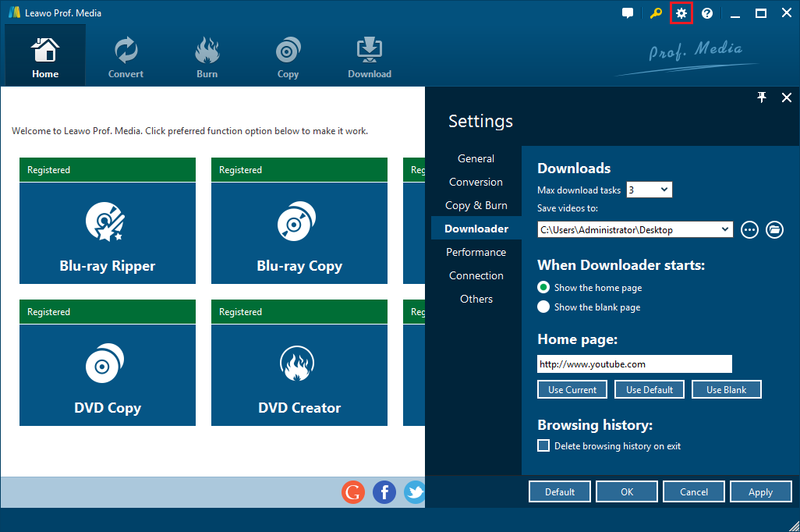 Download and install Leawo Video Converter on your computer. The following steps show detailed operation on how to watermark a video before uploading to YouTube. 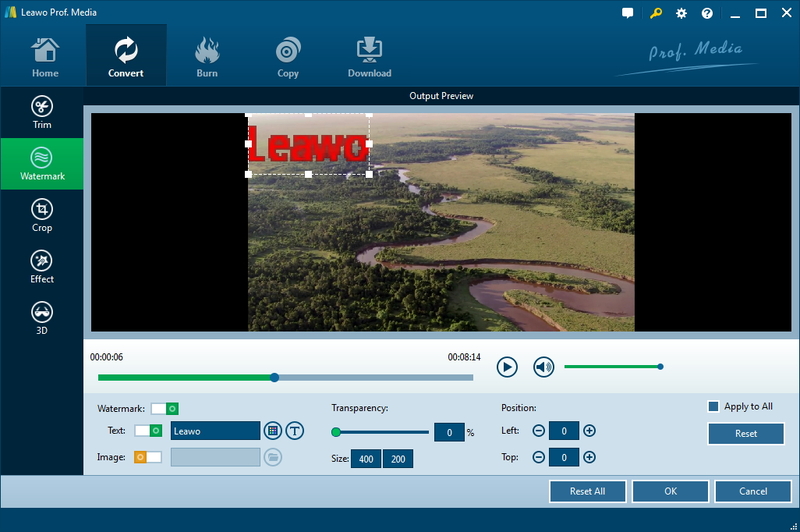 Kick off Leawo Video Converter, and then open the “Convert” module. Directly drag and drop your videos into this program. After loading source video file(s), you could see an edit icon in each loaded video title. Click it to enter the editing panel. Several editing features are available here: Trim, Watermark, Crop, Effect, 3D, etc. Open the “Watermark” tab and then switch the “Watermark” option to green. Determine to add either image or text watermark to YouTube video. You could adjust parameters of watermark, including: position, transparency, text font, text color, etc. These settings are very easy to complete. After setting watermark, click the “OK” button to exit. Now, next to the “Add Photo” button, there is a clickable button. Click it and then choose “Change” option on the drop-down panel. On the follow-up “Profile” interface, choose output format from either “Format” or “Device” group. MP4 Video is recommended since YouTube accepts it. 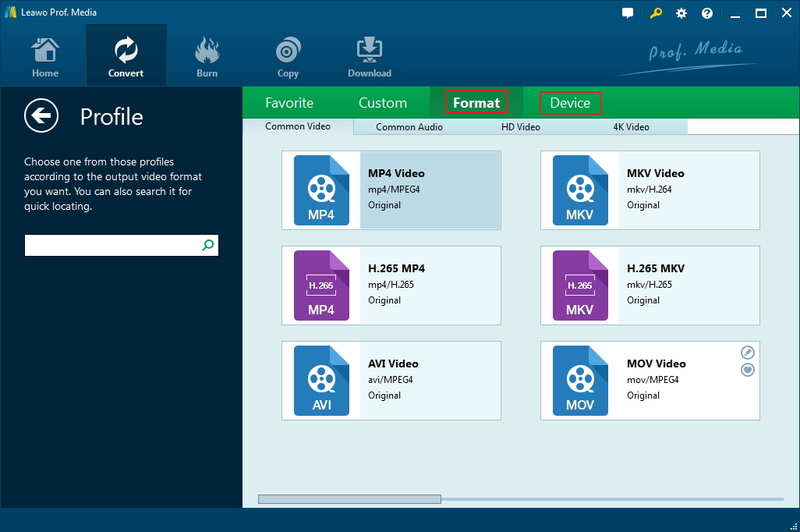 You could adjust the parameters of the output MP4 Video format to meet YouTube requirements, including video codec, bit rate, aspect ratio, frame rate, audio codec, channel, sample rate, etc. To change these, click the “Edit” option on the drop-down panel after setting output format. After setting output format, click the big green “Convert” button. Then, on the popup sidebar, set output directory in the “Save to” box. Finally, click the bottom “Convert” button to start converting. When the conversion finishes, your videos would be watermarked. You could then upload the converted videos to YouTube as usual. You could also add logo to uploaded YouTube video on the background of YouTube. Follow the below steps to learn how to watermark a YouTube video on YouTube backstage. 1. Sign into your YouTube as you always do. 2. Move mouse to the thumbnail icon of your account and click it. 3. On the drop-down panel, click the “Settings” option. 4. Click the “View additional features” option. 5. Then, click the “Branding” tab on the left sidebar. 6. On the new popup page, click the “Add a watermark” option. 7. On the popup window, click “Choose a file” option to browse and upload an image from you computer as watermark. Click “Save” to start uploading. 8. On the new page, click the “Display Time” box to set the duration of the watermark. 9. Then, click the “Upload” button to start uploading watermark to your YouTube videos. 10. Then, you could go to your video management part or open any of uploaded video to view the watermark you’ve just uploaded. In this way, you will be able to add watermark to every video you have uploaded to YouTube. In other words, it helps you add watermark to YouTube video in batch. What would you do if you want to turn a YouTube video to your own patent from others’ sharing? You could download the target YouTube video and then add watermark to it in the above mentioned ways. Now, you only need a YouTube video downloader program. Leawo Video Downloader is exactly what you need. It’s a professional online video downloader program that could download online videos from 1000+ sites including YouTube, Facebook, Veoh, VEVO, etc. Download and install this video downloader program on your computer and then launch it. Follow the below steps to learn how to download YouTube videos for watermarking. Click the wheel icon on the top-right corner and then navigate to the “Downloader” tab to set output directory in the “Save videos to” box. Open the “Download” interface, then directly copy and paste the video URL from YouTube to this browser. Play back the target video to see if it’s the video you want. On the right sidebar of Leawo Video Downloader, you could see diverse downloading options in different resolutions, formats, content and quality. Select the one you want to download and click the download icon. Upon a click on the download icon, Leawo Video Downloader would start to download YouTube videos immediately. You could view the downloading videos under the “Downloading” tab. After downloading, you could see the downloaded videos under the “Downloaded” tab. 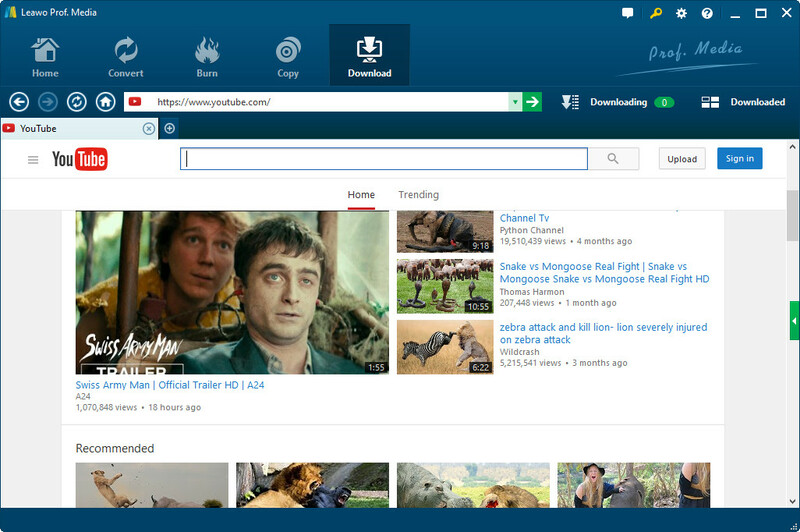 Now, you could make use of Leawo Video Converter to add watermark to YouTube videos. What is better in adding watermark to YouTube videos, Leawo Video Converter or YouTube’s own watermarking feature? Actually this depends on your needs. If you want to add a watermark to all your uploaded videos, and you would like the watermark appear on the same location, YouTube’s own watermark feature is without doubt what you need. However, if you want to add text watermark to video for uploading to YouTube, and you want the watermarks diverse on different videos, Leawo Video Converter would be a better choice. What’s more, Leawo Video Converter contains other editing features that could improve your digital entertainment a lot.